Meet Mr. Jannon, an ex web-designer as “a result of the great food-chain contraction that swept through America in the early twenty-first century”. Jannon lost his job at the NewBagel and now he is struggling to find a new job. 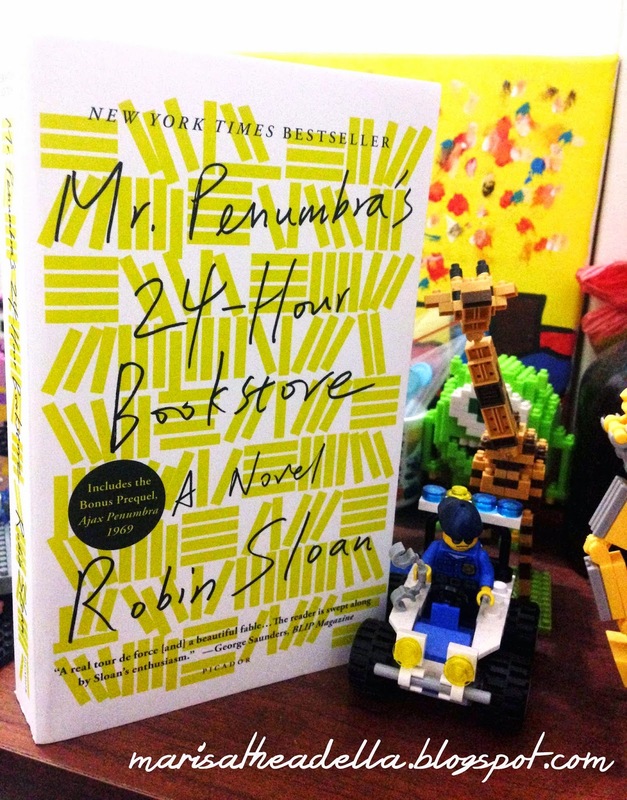 His depression leads him to the 24-hour bookstore; Mr. Penumbra’s 24-Hour Bookstore. Jannon describes the bookstore as “absurdly narrow and dizzyingly tall, and the shelves went all the way up- three stories of books, maybe more”. He met Mr. Penumbra, a tall and skinny old man with blue eyes that match the blue sweater he wore that first day Jannon met him. When Penumbra asked him about a book he loves, Jannon immediately mentioned The Dragon-Song Chronicles- the book he has read three times since he was obsessed with it back in sixth grade (and the very same book that would help him throughout his adventure). So then meet Mr. Jannon, the night clerk at Penumbra’s. Mat (his roommate) was the one who encourages Jannon to open the book from the Waybacklist for the first time. Surprisingly, the books contain solid matrix of letters- an undifferentiated jumble. The next day, Jannon’s long-term best friend who was bounded by The Dragon-Song Chronicles, Neel Shah, came to visit the store. He told Neel the whole story about the store and soon they were bounded again by the upcoming adventure that is waiting for them open-handed. Jannon real adventure was actually started after he met Kat Potente, a beautiful Googler he wanted to impress. He develops an analysis of the clientele’s behavior and, with a little help from Kat and Mat, he recognizes that the borrowing-pattern of the books in the Waybacklist form a face- the Founder’s face. For the rest of the story, Jannon, with the help from his variously talented friends, works hard to decode Aldus Manutius’s codex vitae. Undoubtedly, it doesn’t contain the secret to eternal life (Ya, duh!). As I told you before, the book The Dragon-Song Chronicles helps him to solve everything, but don’t worry I will not spoil the entire story. Grab the book and spoil it yourself! I would say that Robin Sloan is brilliant. The novel delivers fresh adventure and imagination. He brings both papers and computers in the story- two worlds that seem wide apart today. He uses libraries, bookstores, museums and ancient books to drag us back to the time when publishing companies were as cool as Internet provider companies in our modern society. In the same time, he uses high-tech, beyond imagination technologies that we never knew existed. He creates the world in which paper and computer walk side by side. He talks about history, present and future in a passionate way. Though, too good to be true- he decided to make the characters and the stories of the book relate one to another. Jannon’s adventure might be long, but it is not that challenging (at least for me) since snap-there’s a clue, snap-there’s a friend to help, snap-there’s an audiobook to hear. I mean, I know that sometime the biggest mystery of life lies in the plain sight, but it shouldn’t be that plain. People have worked for centuries to break the code, at least Jannon should struggle a little bit more. I think it would be best if Sloan breaks the novel into a chronicle. Well, it’s just a plain suggestion tho.